Oscar & J, originally uploaded by plingthepenguin. 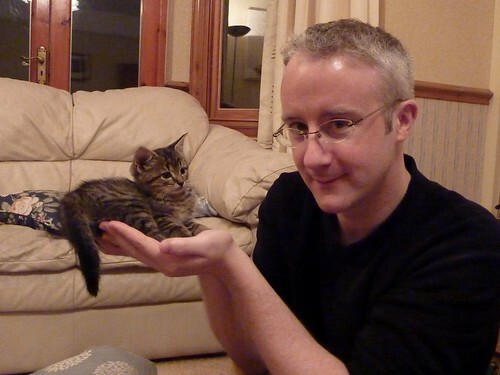 Our friends Jonathan & Becky have just got themselves a kitten, and on Sunday we went round to meet Oscar. He's a very solemn little kitten at the moment, who was carefully exploring the house and he squeaks adorably when he wants you to pick him up for a cuddle. Current Music: Various "Dreamboats & Petticoats 2 (CD1)"
No no, one cat is sufficient! I find this statement very confusing, the correct cat ratio is a minimum of 1:1. You are clearly SHORT at least one cat. That you've been suffering in this state as long as you have is frankly alarming. Enabler! Pusher! Be off with you! Well really, that's why 1:1 is the minimum. Certainly I've found 2:1 to be very agreeable.